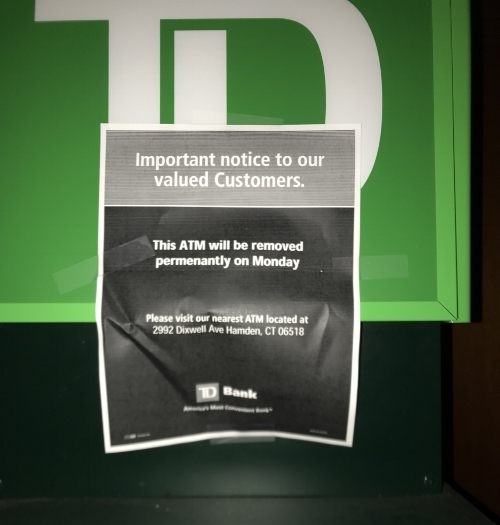 Quinnipiac students have been surprised to learn that their reliable TD Bank ATMs and branch are no longer. The Office of Finance announced the change in student banking in May and again in late August when the fall semester began. With the start of a new semester came the start of a contractual agreement. TD Bank and Quinnipiac had previously arranged a 10-year agreement, which came to a close at the end of the 2017-2018 school year. located in the Carl Hansen student center. In addition to this, four new ATMs will be installed across all three campuses. It is no doubt that the sudden shift in banking will leave students, faculty and other staff left with no other option than to open a new account with People’s United Bank. With renovations beginning as soon as Oct. 15, students were advised to think about opening an account with People’s United but some are reluctant to take that step. “I don’t get why the school would make a drastic change like that. I get that contracts expire but couldn’t they renew it for our [the students] sake?” Vanessa Harris, a senior RA said. According to a Q30 survey 8.5 percent said they have an account wile 82 percent said they don’t. The ATM swaps are said to go into effect on Sept. 24. “I never had TD or People’s United Bank, but I do know my friends are having trouble because they now get charged for using the ATMs even though they switched to TD Bank in freshman year. For them, changing it now just created a lot of issues for students who don’t have a lot of money to begin with,” said Kaycie Romanello, a senior at Quinnipiac. A large majority of the QU student body banks with TD and the consensus around campus is that the swap will cause great inconvenience. “There’s no going back since they’ve already paid for everything and entered into a new contract but administration should get ready for lots of complaints,” Harris said.